This varied group of orchids includes plants from any environments, some come from hot and dry areas while other grow in less severe conditions. Most Oncidium thrive with one to several hours of sunlight a day. Generally thicker leaved plants can stand more light. In the home, east, shaded south and east windows are ideal. Generally plants with large fleshy roots and/or leaves need less frequent watering than thin leaved and/or rooted plants. Plants should be thoroughly watered and not watered again until nearly dry through the pot. In the heat of summer in a dry climate like Calgary, this may be every few days and in the winter here, it may even be every 10 days. Also the type of potting media will determine the frequency of watering. Pots with moss generally take longer to dry out than plants potted in bark. Water only in the morning so the leaves are dry by nightfall to avoid rot from occurring on the leaves. 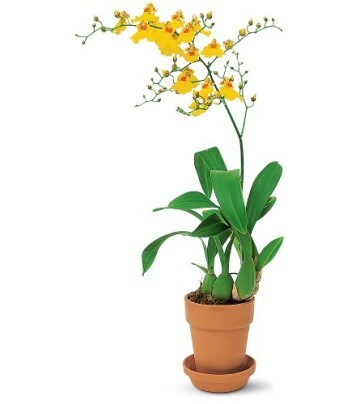 Oncidium require humidity between 30-60%. In the home, set the plants on trays of gravel, partially filled with water so that the pot never sits in water or have a humidifier in the room. Mist the plant in dry climates or during dry weather in the morning only. Misting is not required for fleshy leaved types. Use a fertilizer high in nitrogen (grow fertilizer) from about March to September and a fertilizer high in phosphorus (bloom fertilizer) the rest of the year. When in active growth plants need fertilizer every 2 weeks and when not growing, once a month. Thorough flushing with clear water every month is recommended to prevent build-up of fertilizer salts. This is best done in the Spring after blooming. Potting is usually done every 1 – 3 years. Mature plants can grow in the same pot until the potting medium starts to decompose, usually in 2 years. Root rot occurs if plants are left in a soggy medium. A fine grade potting medium is usually used for fine rooted plants and coarser mixes with large rooted plants. To re-pot, remove the entire old medium from the roots, trim soft/rotted roots and spread the remaining roots over a cone shape of medium in the bottom if a new pot. Fill the rest of the pot with medium, working it through the roots, so that the junction of the roots and the stem is at the top of the medium. Keep plant shaded and humid , but drier in the pot, for several weeks, to promote new root growth. Paphiopedilum, or slipper orchids, originate from the jungles of the Far East and Indonesia. They are semi-terrestrial, growing in humus and other material on the forest floor, on cliffs in pockets and occasionally in trees. Most Paphiopedilum prefer shady conditions. In the home, east, shaded south and east windows are ideal. Water must be available to the roots constantly, since they have no pseudbulbs, and therefore store most of their water in their leaves. They need a moist medium – never soggy, but never dry either. Water once or twice a week and water only in the morning so the leaves are dry by nightfall to avoid rot from occurring on the leaves. 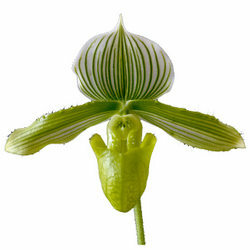 Paphiopedilum require humidity between 40-50%. In the home, set the plants on trays of gravel, partially filled with water so that the pot never sits in water or have a humidifier in the room. Mist the plant in dry climates or during dry weather in the morning only. This is best done in the Spring after blooming. Potting is usually done every 1 – 3 years. Mature plants can grow in the same pot until the potting medium starts to decompose, usually in 2 years. Root rot occurs if plants are left in a soggy medium. A fine grade potting medium is usually used for fine rooted plants and coarser mixes with large rooted plants. To re-pot, remove the entire old medium from the roots, trim soft/rotted roots and spread the remaining roots over a handful of medium in the bottom if a new pot. Fill the rest of the pot with medium, working it through the roots, so that the junction of the roots and the stem is buried ½” in the center of the pot. Keep plant shaded and humid, but drier in the pot, for several weeks, to promote new root growth. Do not over pot the average plant should have a 4-6” pot.